Sometimes we have to conjecture about a relative in order to move our research forward or at least get ideas of what other records could help us. Be careful with whom you share that conjecture as sometimes speculation suddenly becomes a “fact” for which you become the source. If you include speculation in your research notes, clearly label that speculation as speculation. Otherwise you may inadvertently convert your own speculation to fact. Was Your Relative’s Picture in the Newspaper? Newspapers can also contain pictures of your relative–if you are lucky. This picture of Heye Albers was in an 1898 issue of The Rocky Mountain News. Fortunately it was an ink sketch which comes across better than photographs which were more common somewhat later. 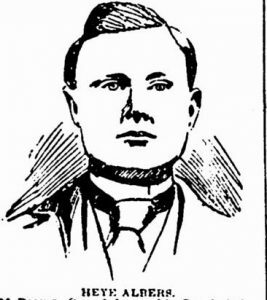 Fortunately his name was in the text of the article as at the time this picture was located the OCR did not “read” the name under his portrait. Returned Home in Their Old Age? Is it possible that relative you can’t find “returned home” in their old age? A relative of mine left Illinois in the 1870s with his family in his thirties, living in Colorado and New Mexico. Sometime after the 1910 census, he returned to Illinois where he had some relatives (mostly cousins) and eventually died. Why he returned I don’t know, but his children were scattered throughout New Mexico and the western United States. Don’t neglect land records if your city-dwelling ancestor was a property owner. Deeds to settle up an estate or transactions completed after your ancestor moved to a new location can be particularly helpful, but any deed can contain “new to you” information. Deeds for my children’s early 19th century Boston ancestors contained the occupation of the grantor and grantee. When first communicating with a newly discovered cousin, try not to overwhelm them with information, particularly all the details of family scandals. For someone whose interest in family history is just developing, too much information may intimidate them and too many scandalous details may push some people away. I’m not suggesting keeping secrets, just take it slowly. And you may be surprised–sometimes those new cousins already know all the family skeletons. First Land Purchase in a New Area? Or he might have thought someone from “back home” would be willing to pay a higher price than the property was worth <grin>. Several years ago I focused on a certain Benjamin Butler in an 1850 census enumeration as being “mine.” Using that enumeration as the starting point, I searched other records and made progress. I located a fair amount of information. One problem–I didn’t track WHY I thought this 1850 census entry was for the correct person. What I found later all tied to the 1850 guy, but not to the one who was really “mine.” It took me hours to reconstruct my reason and that was time wasted. Fifteen minutes to write up my reason to begin with would have saved me time later. 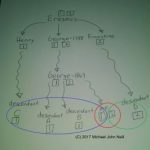 Most of us use chronologies in our ancestral research–consider making a resume for your ancestor. List what years he worked what jobs. Census and city directories are great ways to start getting this information, but death certificates, obituaries, estate inventories, etc. all may give occupational clues. When analyzing a record or set of materials that does not make sense, get away from what you “want to prove” and try to think “what do these documents really say?” You may find that they do not say what you think they do. And not every record says what we want or expect it to say. Sometimes our preconceived notions are what is getting in the way.